Fortunately, not only for TR personally but also for the course of American history, this horrible disaster ultimately led to positive changes in his life. Had he not had to rebuild his life out of such extraordinary grief, he might have simply stayed active in New York state, and to a lesser extent, New York City, politics and not risen above relative obscurity. The loss of these beloved women, however, forced a man who until then hadn’t seemed very good at serious introspection to detach himself from state and national politics, and to essentially retire from public life into a totally different world in Dakota Territory, the land of western cowboys, cattle, six-guns, blizzards, dust storms, and outlaws. For the first time in his life, TR got on with plain every-day working Americans; cowboys, settlers and adventurers alike. Realizing this way of life was fading fast, he shared his experiences in a series of articles and later, books, which brought the Wild West into the homes, salons and parlors of millions of city-dwellers. TR’s time in the West not only helped him recover from loss and grief, but also taught him he could lead ordinary men, command their respect and even inspire them. 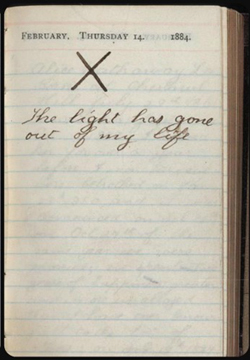 His time of healing and discovery in Dakota Territory proved to TR that he had the capacity to endure hardship, rise above adversity and inspire loyalty and action in others. All of this in turn set the stage for his experience as a volunteer officer and eventual commander of the 1st U.S. Volunteer Calvary—better known as the Rough Riders—in Cuba during the Spanish-American War. When that war loomed on the horizon, instead of merely being a high-strung upper-class gentleman living a life filled with fox hunting, attending salons and speechifying on the New York Assembly floor in Albany, crucially, he also had been tested in the West. So TR could throw himself into the Rough Riders, head for Cuba, and lead men in desperate combat in two major battles, knowing that he could handle it all and more. 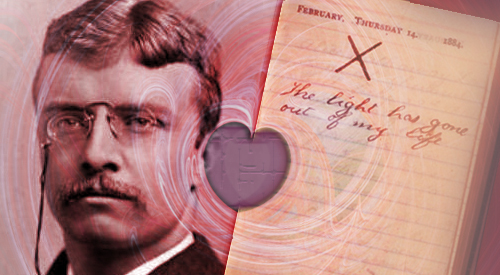 Though Valentine’s Day 1884 was a terrible tragedy for TR, it eventually became a gift for all of us who have forever benefited from his courage, action, and passion. Keith Simon is a member of the Theodore Roosevelt Association board of trustees.